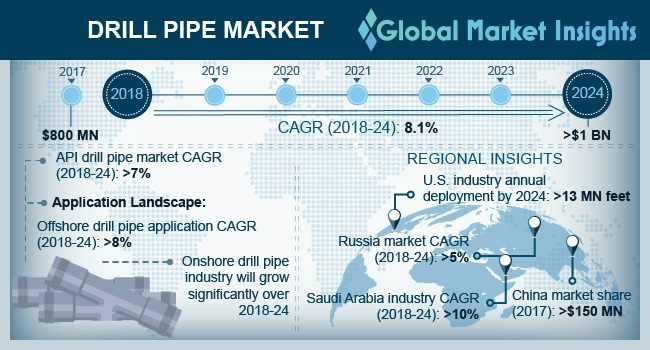 Drill Pipe Market size will surpass USD 1 Billion by 2024, as reported in the latest study by Global Market Insights, Inc. Drill pipe market is set to witness an appreciable growth on account of ongoing government ventures to augment crude production coupled with rising investments across upstream sector. Stabilizing crude oil prices coupled with escalating primary energy consumption will further stimulate the business growth. For instance, as per the International Energy Agency, global oil demand is projected to reach 104.7 mb/d by 2023. Implementation of advanced production techniques including horizontal drilling in combination with hydraulic drilling will propel the drill pipe market size. Moreover, ongoing exploration & production of unconventional resources will drive the industry growth. For instance, as per Energy Information Administration (EIA), tight oil is expected to be the leading source of the U.S. accounting for about 70% of total production by 2040. Saudi Arabia drill pipe market size is anticipated to expand over 10% by 2024. Increasing onshore rig count coupled with crude oil production target set by the government will drive the product adoption. For instance, in 2018, Saudi Aramco, the state-owned oil company signed a deal with the U.S. based National Oilwell Varco Inc. (NOV) for the manufacture of onshore rigs and drilling equipment. Premium drill pipe market size is set to witness strong growth owing to the product’s suitability for the exploration of deep and ultra-deep-water reservoirs along with the ability to function effectively across difficult geographical terrains. API grade drill pipes are preferred over premium grade across onshore on account of their cost effectiveness. The U.S. drill pipe market is set to surpass annual deployment of 13 million feet by 2024. Increasing exploration of unconventional wells coupled with ongoing capital expenditure from independent players will stimulate the industry growth in the country. According to the U.S. Energy Information Administration, 44 onshore oil companies have augmented their capex by 72% from 2015 to 2016 in the country. Furthermore, availability of proven technically recoverable shale oil and gas reserves will further enhance the product adoption. Offshore drill pipe market share is anticipated to witness gains over 8% by 2024. Technological advancements to efficiently explore deep-water and ultra-deep-water reserves in different terrain at an optimum cost will augment the business landscape. Favorable government policies to improve domestic crude production from untapped reserves will further fuel the product adoption. Increasing number of E&P projects in the Amazon region will drive the Latin America drill pipe market growth. In 2016, Petroamazonas signed a treaty worth approx. USD 1 billion to extract 84.6 MMbbl of oil from incremental reserves and increase its output by around 30,000 bbl./day in 2018. Key industry participants across the drill pipe market include Tenaris, Tejas Tubular Products, Vallourec, Premier Drill Products, DP-Master Manufacturing (S), E&M Supply Group, Ferrostaal Piping Supply, TMK Group, Oil Country Tubular Limited, Drill Pipe International, Texas Steel Conversion, Hilong Group, Holly Pipe Corporation and RK Pipe & Supply.